Of course, there is also a bit of curiosity, but actually such an stocktaking will help to control the stocking better the next few years. However, electricfishing should not be repeated too often. The transition from the end of winter into spring sometimes takes only two weeks. The warmth of the sun is like a promise of the coming, beautiful months. Let us use this time, whether in fly fishing or simply in nature. Well over 30 years I offer fly fishing clinics in Velden. Not quite that long the fly fishing meeting takes place in Velden. In four weeks, from 26.04. until 28.04.2019, it's time again, as usual at the Gasthof zur Traube. Fly fishing, fun, fly tying and a good time awaits visitors. PS: Marco Reisen takes part with the new Vision rods. Time to try them out. See you then, Wolfgang. Gold bead nymphs are now very popular. You find them very often in fly boxes. Many of these patterns are based on the same basic structure. This is about the skeleton of these nymphs. 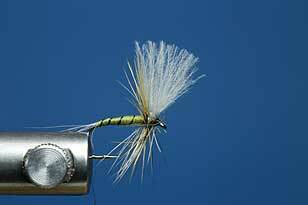 The Blue Winged Olive dry fly is one of the most famous patterns ever. 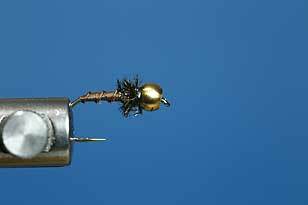 So it is not surprising that there are many different fly tying methods for this fly. At this pattern, the wing is made of CDC fibers. It will take a while until the big trouts can be caught again. We look forward to it and look after our fish locally. Let's see how the damage caused by the cormorants counts. I wish you all a great fishing in 2019. Only 70 km away from our claims in the Yukon is the place Chicken. However, it is not easy to reach. Narrow roads with huge trucks should not leave you impatient. You should simply enjoy this excursion without time pressure.